Guardian applies authentication policies in the order they are displayed on the Web proxy > Authentication > Manage policies page. You can change the order the policies are applied by dragging and dropping them in new positions. 1. Go to the Web proxy > Authentication > Manage policies page. 4. You must restart Guardian‘s proxy service if any changes are made to the authentication policies. Click Restart proxy when prompted. You can make changes to existing authentication policies, including disabling them for later use, without removing the policy. 2. Locate the policy you want to change. 3. To enable or disable an existing policy, highlight the relevant one, and click the grey box in the Enabled column. 4. To edit the policy configuration, click the Edit policy button. Guardian displays the policy on the Web proxy > Authentication > Policy wizard page. 5. Adjust the policy as required. For more information, see Creating Authentication Policies. 7. Review your changes and then click Save to save and apply the changes. 8. You must restart Guardian‘s proxy service if any changes are made to the authentication policies. Click Restart proxy when prompted. Note: If you remove all authentication policies assigned to a policy folder, but do not remove the folder assigned to an interface, the Guardian service stops responding to requests and appears as stopped on the Dashboard. To prevent an interface from using authentication policies, it is recommended you remove the folder as well. 1. 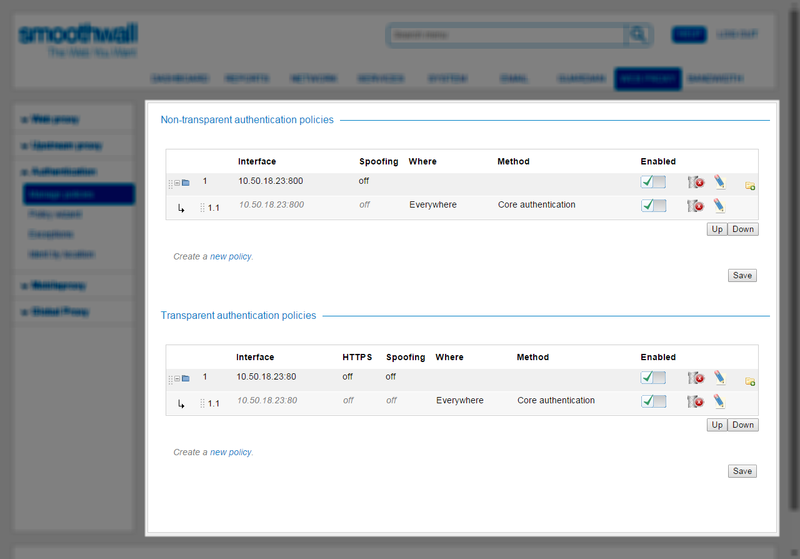 On the to the Web proxy > Authentication > Manage policies page, locate the policy you want to delete.